Cranial ultrasound (CUS) is a valuable tool for brain imaging in critically ill neonates. This video shows a comprehensive approach for neonatal (Doppler) CUS for both clinical and research purposes, including a bedside demonstration of the technique. Ecury-Goossen, G. M., Camfferman, F. A., Leijser, L. M., Govaert, P., Dudink, J. 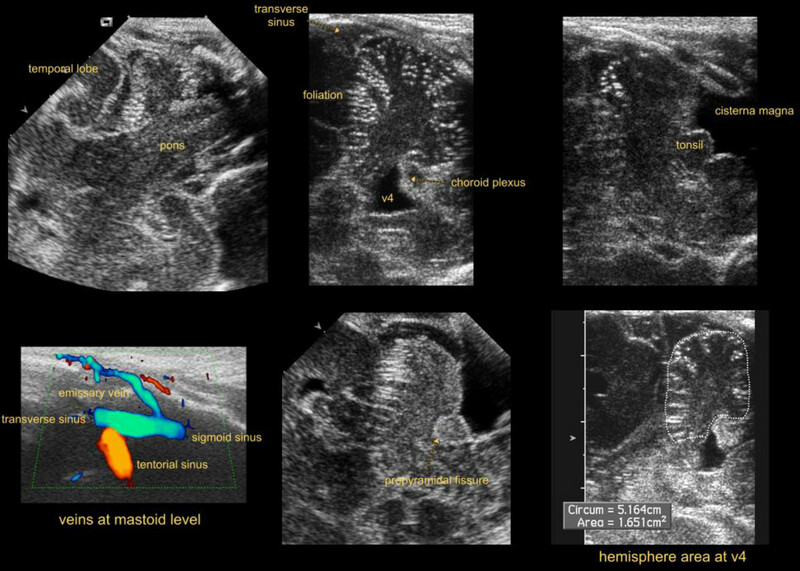 State of the Art Cranial Ultrasound Imaging in Neonates. J. Vis. Exp. (96), e52238, doi:10.3791/52238 (2015). Cranial ultrasound (CUS) is a reputable tool for brain imaging in critically ill neonates. It is safe, relatively cheap and easy to use, even when a patient is unstable. In addition it is radiation-free and allows serial imaging. CUS possibilities have steadily expanded. However, in many neonatal intensive care units, these possibilities are not optimally used. 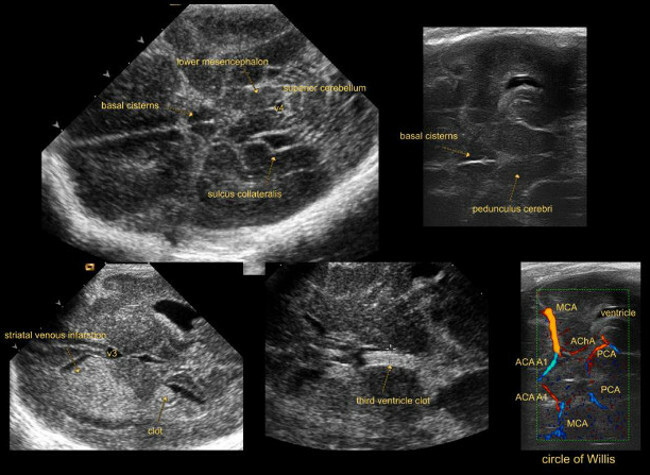 We present a comprehensive approach for neonatal CUS, focusing on optimal settings, different probes, multiple acoustic windows and Doppler techniques. This approach is suited for both routine clinical practice and research purposes. In a live demonstration, we show how this technique is performed in the neonatal intensive care unit. Using optimal settings and probes allows for better imaging quality and improves the diagnostic value of CUS in experienced hands. Traditionally, images are obtained through the anterior fontanel. Use of supplemental acoustic windows (lambdoid, mastoid, and lateral fontanels) improves detection of brain injury. Adding Doppler studies allows screening of patency of large intracranial arteries and veins. Flow velocities and indices can be obtained. Doppler CUS offers the possibility of detecting cerebral sinovenous thrombosis at an early stage, creating a window for therapeutic intervention prior to thrombosis-induced tissue damage. Equipment, data storage and safety aspects are also addressed. Since its clinical introduction in the late 1970’s cranial ultrasound (CUS) has been widely used for detecting congenital anomalies and acquired brain lesions during the neonatal period. In many neonatal intensive care units (NICUs), CUS has become indispensable in the care for critically ill neonates. Major advantages are its relatively low cost and the fact that it can be performed at bedside, even when a patient is unstable. In addition it is radiation-free and allows for serial imaging. Another technique often used for neuroimaging in critically ill neonates is magnetic resonance imaging (MRI). MRI provides excellent image quality, but its clinical use in NICU’s is currently limited because of logistic and safety issues1. Over time, quality of CUS has drastically improved, with advancing technique leading to higher resolution, faster image processing and digital display and back-up. Important brain structures can be adequately visualized using optimal settings. Traditionally, images are obtained through the anterior fontanel. This approach is less suitable for evaluation of infratentorial structures because they are located far away from the transducer and the highly echoic tentorium impedes their assessment. Use of high-frequency linear transducers through alternative acoustic windows and adapted settings also provides access to these brain regions. Examples of these supplemental acoustic windows are the lambdoid (posterior), mastoid and lateral (temporal) fontanels. So far, however, only few NICUs use these additional acoustic windows routinely2-5. Doppler techniques can be used for screening patency of intracranial vessels. 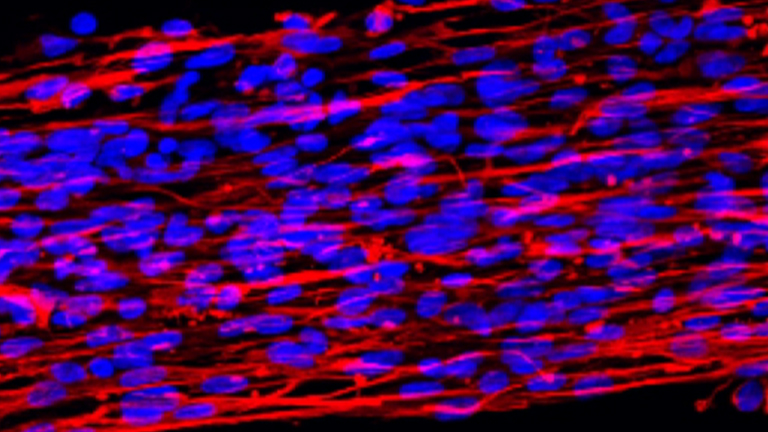 Flow velocities and indices in cerebral arteries can also be obtained. Some manufacturers now provide hardware to visualize flow around 2 cm/sec (Raets, et al., unpublished data). Small vessels are well displayed: medullary trunks and channels, subependymal veins tributing to the thalamostriate veins, and perforator arteries. 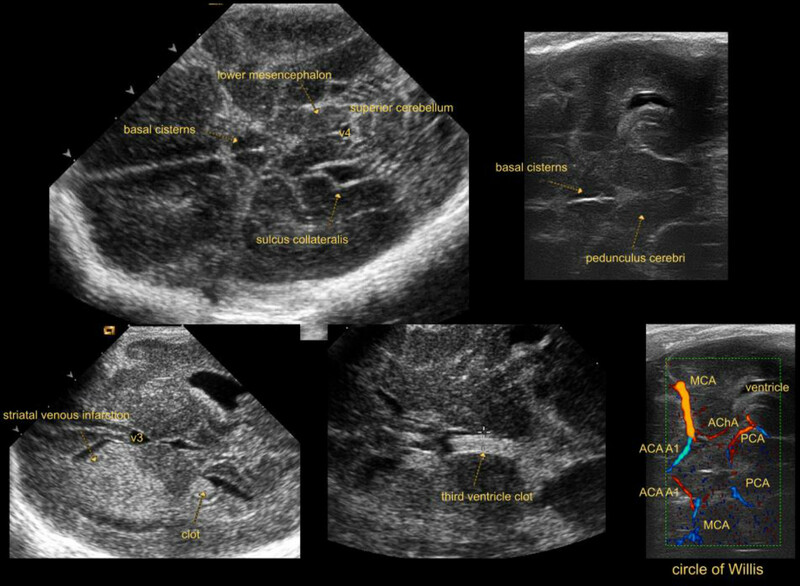 We present our approach of neonatal CUS, focusing on the use of different transducers, multiple acoustic windows and Doppler techniques. Neonatologists and radiologists use this approach in daily clinical practice but is also suitable for research purposes. In the practical part of the video we demonstrate bedside use in the NICU. NOTE: This protocol follows the guidelines of the local human research ethics committee. NOTE: General considerations regarding equipment, data storage and safety are addressed in the Discussion. 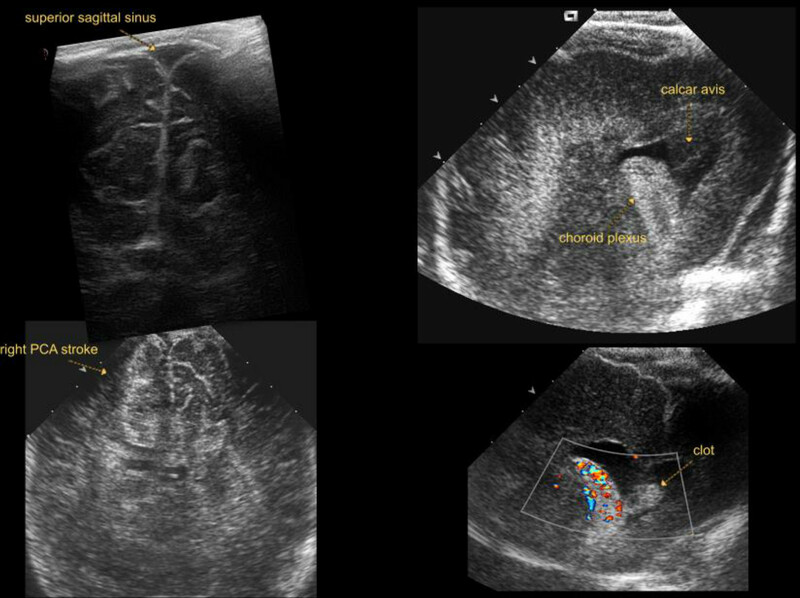 Obtain images using a high-resolution, real-time, mobile 2D ultrasound machine with multiple transducers with a band of frequencies (see Discussion). Typically, obtain images of good quality using a probe with a frequency of 7.5 to 8.5 MHz. Schedule the CUS examination so that it does not coincide with other procedures such as blood sampling. Ensure that a health care worker or a parent is available to support and/or comfort the neonate during the examination, using strategies such as those according to the principles of Newborn Individualized Developmental Care and Assessment Program6. Install the ultrasound machine along the incubator or cot. Apply transducer gel to the probe to ensure good contact between the probe and the skin. Consider warming the gel before use. Start imaging through the anterior fontanel with a convex probe in B-mode. Place the probe in the middle of the fontanel with the marker on the probe turned to the right side of the neonate. The left side of the brain will then be displayed on the right side of the monitor. NOTE: Imaging through the anterior fontanel can be performed with the neonate in any position3. For research purposes it may be necessary to strive for a standard head position. Record images in at least five coronal and five sagittal planes. In the first image adjust depth, gain and time gain compensation settings to produce an image filling the sector, containing the cranial contours, avoiding too bright or dark images and aiming for an equilibrium between reflections from nearby and deeper structures. NOTE: Try to obtain perfectly symmetrical images. When lesions near the frontal lobe convexity are suspected, consider recording specific oblique coronal sections, so that one hemisphere is displayed in better detail (Figure 1). For the coronal prefrontal image, angle the probe forwards to visualize the frontal lobes, anterior to the frontal horns of the lateral ventricles at the level of the olfactory sulci. For the coronal image at the level of Monro, angle the probe to visualize the coronal section anterior to the tela choroidea to depict the frontal horns of the lateral ventricles, cavum septi pellucidi, corpus callosum, sulcus cinguli. Note the echogenicity of parts of the basal ganglia. For the coronal image at the level of thalamus, angle the probe backwards to identify the lateral fissures, tela choroidea in the roof of the third ventricle and temporal lobes. Note the echogenicity of the thalamus (especially ventrolateral nuclei) in relation to the basal ganglia. Note that network injury in pulvinar may be visualized in an extra coronal section just in front of the atria. For the coronal image at the level of atria, visualize the lateral ventricles at the level of the choroid plexus. Identify the temporal lobes and cerebellar hemispheres. Note the echogenicity of periventricular white matter compared to choroid plexus. Compare optic radiation with the normal hyperechoic areas above and lateral to the atria in preterm neonates. For the coronal parieto-occipital image, angle the probe backwards to the level of the parieto-occipital sulcus to identify the parietal and occipital lobes. Rotate the probe 90° with the marker on the probe facing towards the neonate’s face. The anterior part of the brain will be displayed on the left side of the monitor. Record images at the level of the following structures (Figure 2). For the midsagittal image, visualize the corpus callosum, cavum septi pellucidi (CSP), third and fourth ventricle, vermis, cisterna magna, pons and mesencephalon. Note the presence of cavum Vergae and cavum veli interpositi7. For the parasagittal image through one gangliothalamic ovoid (e.g., the right), angle the probe sideways for a parasagittal view through the lateral ventricle. Identify the choroid plexus and note the echogenicity of thalamus and basal ganglia. The scanned side for parasagittal planes should be appropriately indicated with text tools. For the parasagittal insular image, angle the probe further lateral through the insula. Identify the lateral fissure and frontal-, temporal-, parietal- and occipital lobes. Repeat parasagittal images for the contralateral side (i.e., the left). Continue imaging through the anterior fontanel with a convex probe using color Doppler. Consider evaluating flow velocities in cerebral arteries and veins and obtaining derived indices. NOTE: Resistive index (RI) is defined as peak systolic velocity – end diastolic velocity / peak systolic velocity. RI is angle-independent, absolute velocity values are not8-10. RI is not similar in arteries of different caliber. Serial measurements are only useful if performed in the exact same location of the same vessel. Visualize the transverse sinuses at the level of the cerebellum. If only one or none the transverse sinuses is visualized, try lowering the pulse repetition frequency (PRF). If then still only one or none of the transverse sinuses can be identified through the anterior fontanel, use a high frequency linear probe for visualization through the mastoid fontanel (see section 4.4.2). Visualize the circle of Willis with internal carotid arteries, middle cerebral arteries and anterior cerebral arteries at the level of the frontal horns of the lateral ventricles. Distinguishing the left and right anterior cerebral arteries is often challenging, but is usually unnecessary. Identify the striatal candelabra of arteries. Angle the probe backwards to visualize the basilar artery with adjacent jugular veins. Angle even more backwards to visualize the internal cerebral and thalamostriate veins. Record an image in the sagittal plane of one anterior cerebral artery (Figure 4). Assess flow velocity and RI at a specific part of this vessel (usually below the genu of the corpus callosum). Near the midline velocities in the internal cerebral vein can be readily measured. Using a high frequency linear probe in a coronal plane in the anterior fontanel, identify the superior sagittal sinus. If this should fail, reduce the amount of pressure applied with the probe to the fontanel. NOTE: The linear probe can be used for detailed visualization of superficial structures (meninges, arachnoid and subdural space, cortex). Tangential vessels are in the subarachnoid space. Ideally, Doppler imaging as described in the previous steps will be performed during the first CUS examination of the neonate. During follow-up examination some of the steps may be skipped. In case of suspected cerebral sinovenous thrombosis Doppler imaging as described in steps 3.3.5.1, 3.3.7 and 4.4.2 should be performed. Next, continue examination through alternative acoustic windows. Consider recording images through the lambdoid (posterior) fontanel using a convex probe (Figure 5). The posterior fontanel is located at the junction of the sagittal and lambdoid sutures3,11. Image through the posterior fontanel by placing the neonate in the lateral decubitus position. NOTE: In many premature infants satisfactory images may also be obtained through the posterior aspect of the sagittal suture with the infant in a supine position3. Position the probe in the middle of the posterior fontanel for a sagittal view. Angle the probe slightly off midline to identify the body of the lateral ventricle and its occipital horn. Turn the probe roughly 90° to obtain a coronal view. Identify the occipital horns of the lateral ventricles. Consider recording images through the lateral (temporal) window using a convex or linear probe above the ear (Figure 6). If necessary, obtain images through the lateral window to allow a detailed view of the brainstem12. Place the probe horizontally above and slightly in front of the ear. Move the probe until the cerebral peduncles are visualized. NOTE: Other structures that can be identified are the third ventricle, aqueduct and temporal lobes. Using color Doppler, the circle of Willis can be visualized. Record images through the mastoid fontanel (Figure 7). The mastoid fontanel is located behind the ear, at the junction of the temporal, parietal and occipital bones4. Image through the mastoid fontanel by placing the neonate in a lateral decubitus position3. NOTE: In our experience, neonates often show signs of discomfort when images through the mastoid fontanel are obtained. Therefore, it would be best to do this after imaging through the anterior fontanel and other acoustic windows. We hypothesize that this discomfort could be caused by the mechanism of auditory response to pulses of radiofrequency energy13. Image through mastoid fontanel using a convex probe. Place the probe parallel to the ear to obtain a coronal view. Sweep the probe back and forth to identify the cerebellar hemispheres, vermis, third and fourth ventricle, pons and cisterna magna. In small preterms the contralateral cerebellar hemisphere may be well depicted. Image through mastoid fontanel using a linear probe. If (one of) the transverse sinuses cannot be identified through the anterior fontanel, use a high frequency linear probe for visualization through the mastoid fontanel. Place the probe parallel to the ear lobe to obtain a coronal view. Identify the cerebellar hemisphere and fourth ventricle. Using color Doppler, identify the transverse and sigmoid sinus, tentorial sinus and emissary veins. Consider additional visualization of the posterior fossa through foramen magnum14. Examples of imaging made according to the described protocol are presented in Figures 1-7. Images should be carefully interpreted by an experienced observer. Symmetrical imaging is necessary for adequate interpretation of coronal images made through the anterior fontanel (Figure 1). Any suspected lesion should be visualized in both a coronal and (mid)sagittal plane or by visualization through an acoustic window other than the anterior fontanel. Use Color Doppler for visualization of intracerebral vessels (Figures 3, 4, 6 and 7). Some examples of intracerebral lesions are shown in Figures 5 (right posterior cerebral artery stroke, clot in lateral ventricle) and 6 (striatal venous infraction, third ventricle clot). Reliable measurement using linear, elliptoid and free tracing tools are part of routine imaging (Figure 7). Ventricular measurements such as ventricular index, anterior horn width and thalamo-occipital distance are used in clinical practice to monitor ventricular size. Figure 1: Coronal sections. Imaging through anterior fontanel at standard coronal planes. Figure 2: (Para)sagittal sections. Images through anterior fontanel at standard (para)sagittal sections. Figure 3: Coronal Doppler. Coronal color Doppler images through anterior fontanel. Figure 4: (Para)sagittal Doppler. (Para)sagittal color Doppler images through anterior fontanel. Figure 5: Lambdoid view. Imaging through lambdoid fontanel. Figure 6: Temporal (lateral) view. Imaging through lateral fontanel. Figure 7: Mastoid view. Imaging through mastoid fontanel. We describe and demonstrate a state-of-the-art approach for neonatal Doppler CUS. In experienced hands, this is an excellent tool for safe, serial bedside neonatal brain imaging. In many NICUs the described possibilities are not optimally used. Adding Doppler studies allows for screening of patency of intracranial arteries and veins. Flow velocities can be evaluated and indices obtained. Doppler CUS permits detection of cerebral sinovenous thrombosis at an early stage in the fragile transverse to sigmoid sinus angle, allowing therapeutic intervention prior to stroke2. Use of supplemental acoustic windows enhances detection of brain injury. Another much used technique for neuroimaging in critically ill neonates is MRI. MRI provides excellent image quality and is considered superior to CUS in identifying cerebellar lesions and white matter injury15. However, MRI is expensive and its clinical use in NICUs is limited because of logistic and safety issues1. CUS on the other hand is relatively cheap, directly available and allows serial bedside imaging. A local protocol for sequential CUS imaging is desirable. The use of supplemental acoustic windows, color Doppler imaging, higher transducer frequencies and careful interpretation of images by an experienced observer results in high accuracy to identify brain lesions (Plaisier, et al., unpublished data). In short, CUS is a reputable tool for neonatal brain imaging. For optimal use of the technique, there are aspects regarding equipment, data storage and safety that need to be addressed. Make sure special settings for the neonatal brain are programmed on the ultrasound machine. Use multiple transducers with a band of frequencies. Consider which probe is most suitable for the area of interest. In general, images of good quality can be obtained using a probe with a frequency of 7.5 to 8.5 MHz. A higher frequency results in loss of penetration. A lower frequency allows better penetration and consequently a better view of deeper structures, such as deep gray matter. The drawback of a lower transducer frequency is loss of resolution. This can be resolved by adapting the focus or using multiple focus points. The ultrasound beam has the narrowest width at the depth of the focus point. Adapting the focus point therefore improves resolution, allowing a more detailed view of the region of interest. Using multiple focus points allows better visualization of the area between these points. For standard CUS, the focus point is preferably aimed at the ventricular or periventricular areas16. Multiple focus points may cause artifacts. Consider which probe size is most suitable for imaging. Probes are available in different shapes and sizes. Ideally, the footprint should be small enough to fit in the anterior fontanel, necessitating a convex scanhead. In the smallest preterm infants, only a phased array probe may be small enough to fit in the anterior fontanel: in this probe the ultrasound beam diverges from one point. Phased array convex probes produce pie-shaped (sector) images. In a linear array transducer, crystal elements are arranged parallel to each other, producing a rectangular image with high image quality. However, the high frequency results in loss of penetration and because of its large size the linear array transducer will not optimally fit in the anterior fontanel. Acquiring images of good quality not only depends on the quality of the equipment used, but also on the skills of the examiner. Make sure operators are properly trained in neonatal CUS. Operators should be familiar with functions like gain, time gain compensation, dynamic range, speckle reduction filters. Make sure qualified technical personnel is available to service equipment. Probes contain delicate components, which can easily be damaged if not handled with care. Make a conscious effort to protect equipment during everyday use. Consider how to store the obtained images. They can be digitally stored or printed and stored with the patient’s file. One should be aware of the potential risks and burden of CUS for critically ill neonates. The extra handling involved in the examination and applying pressure and cold gel to the fontanel(s) could lead to respiratory instability. Also, there is a potential risk of dislocating tubes or intravenous devices, of introducing micro-organisms from equipment that is not appropriately cleaned or from the examiner, and of possible hazardous effects of ultrasound waves17. These matters can be prevented or reduced with fairly simple precautions. As mentioned earlier, the infant should be supported by a health care worker or parent according to the principles of Newborn Individualized Developmental Care and Assessment Program6. While handling the probe, keep the applied pressure to a minimum. Cold gel can be warmed before the examination. Ultrasound equipment should be regularly cleaned. After each examination the probe should be wiped clean. Consult with the manufacturer whether probes are suited to be wiped clean with disinfectant. At tissue level, ultrasound energy is converted into heat which may increase local temperature. The amount of energy absorbed depends on tissue type, duration of exposure and ultrasound mode or route. Doppler imaging, though, has higher output potential compared to standard B-mode imaging, because of its intensity and the small area of tissue being examined18. Therefore, keep the duration of exposure to a minimum, especially in Doppler imaging. Regulatory bodies such as the American Institute of Ultrasound in Medicine (AIUM), the British Medical Ultrasound Society (BMUS), European Federation of Societies for Ultrasound in Medicine and Biology (EFSUMB), and World Federation for Ultrasound in Medicine and Biology (WFUMB), have published guidelines on mechanical and thermal indices for diagnostic ultrasound. Thermal and mechanical indices less than one are generally accepted as safe18. Standard settings should be kept within the range indicated in these guidelines and when adjusting settings during examination one should make sure to adhere to these guidelines, especially during color Doppler examination. Make sure to turn the Doppler mode off and switch back to normal imaging mode as soon as the Doppler examination is completed. To date there is no evidence of adverse effects of ultrasound examination in neonates. There have been reports of a mildly increased risk of delayed speech, left handedness in boys and intrauterine growth restriction after fetal exposure to ultrasound18. A recent systematic review found that ultrasonography during pregnancy was not associated with adverse perinatal or childhood outcome19. However, in most of the reviewed studies ultrasound machines were used with less output potential than currently available18. Keeping the aforementioned safety issues in mind, further advances in ultrasound technology will lead to improvement of image quality and will expand the possibilities of CUS imaging. Examples include portable handheld devices, wireless transducers, 3D imaging, functional ultrasonography and ShearWave Elastography. In conclusion, Doppler CUS is an excellent, relatively inexpensive tool for serial neonatal bedside neuroimaging in experienced hands. 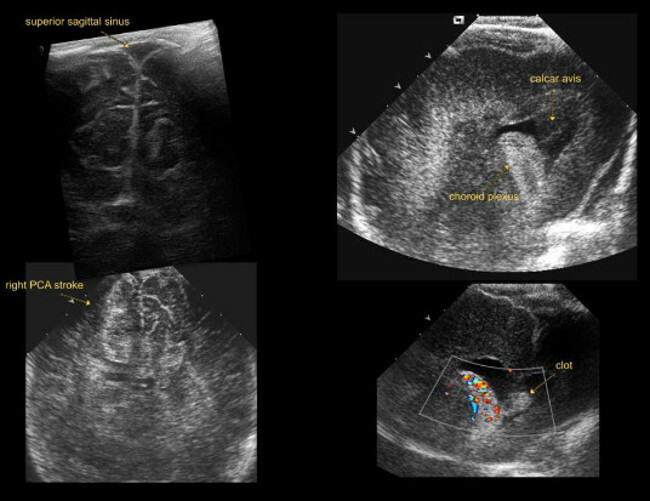 Optimal use of currently available equipment and techniques provides better imaging quality and improves diagnostic value of CUS. We thank the nurses (appearing on film) for supporting the neonates. We thank J. Hagoort, MA, linguist, Department of Pediatric Surgery, Erasmus MC-Sophia Children’s Hospital, Rotterdam, the Netherlands, for reading and correcting the manuscript. Plaisier, A., et al. Safety of routine early MRI in preterm infants. Pediatric Radiology. 42, (10), 1205-1211 (2012). Raets, M. M. A., et al. Serial Cranial US for Detection of Cerebral Sinovenous Thrombosis in Preterm Infants. Radiology. 269, (3), 879-886 (2013). Di Salvo, D. N. A new view of the neonatal brain: Clinical utility of supplemental neurologic US imaging windows. Radiographics. 21, (4), 943-955 (2001). Enriquez, G., et al. 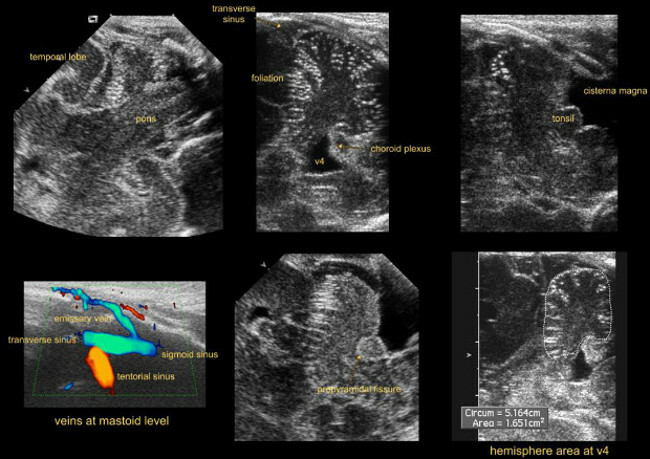 Mastoid fontanelle approach for sonographic imaging of the neonatal brain. Pediatric Radiology. 36, (6), 532-540 (2006). Luna, J. 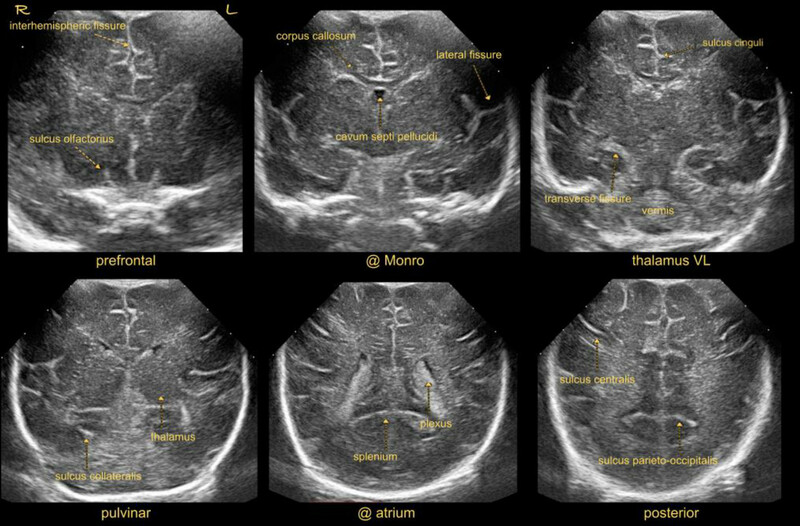 A., Goldstein, R. B. Sonographic visualization of neonatal posterior fossa abnormalities through the posterolateral fontanelle. AJR Am J Roentgenol. 174, (2), 561-567 (2000). Govaert, P., de Vries, L. S. An Atlas of Neonatal Brain Sonography. 2nd, Mac Keith Press. London, UK. (2010). Gray, P. H., Griffin, E. A., Drumm, J. E., Fitzgerald, D. E., Duignan, N. M. Continuous Wave Doppler Ultrasound in Evaluation of Cerebral Blood-Flow in Neonates. Archives of Disease in Childhood. 58, (9), 677-681 (1983). Seibert, J. J., et al. Duplex Pulsed Doppler Ultrasonography Versus Intracranial-Pressure in the Neonate - Clinical and Experimental Studies. Radiology. 171, (1), 155-159 (1989). Volpe, J. J., Perlman, J. M., Hill, A., Mcmenamin, J. B. Cerebral Blood-Flow Velocity in the Human Newborn - the Value of Its Determination. Pediatrics. 70, (1), 147-152 (1982). Correa, F., et al. 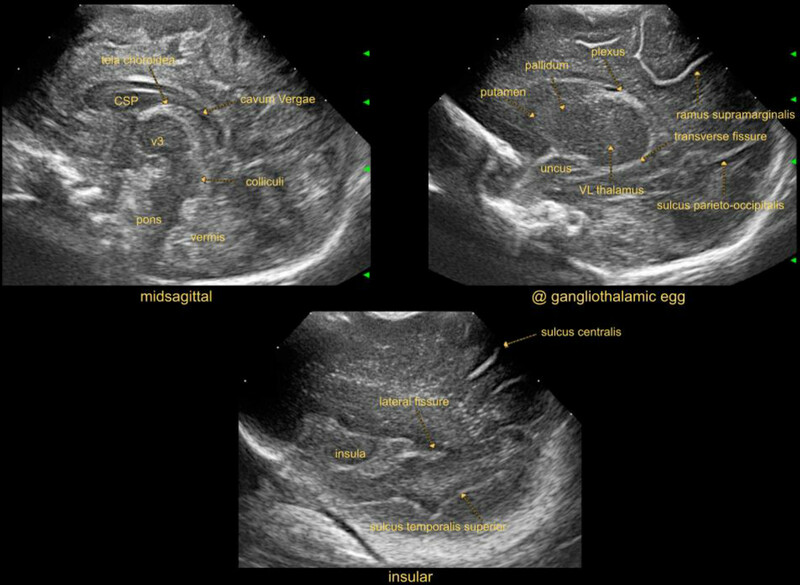 Posterior fontanelle sonography: An acoustic window into the neonatal brain. American Journal of Neuroradiology. 25, (7), 1274-1282 (2004). Helmke, K., Winkler, P., Kock, C. Sonographic examination of the brain stem area in infants. An echographic and anatomic analysis. Pediatric Radiology. 17, (1), 1-6 (1987). Elder, J. A., Chou, C. K. Auditory response to pulsed radiofrequency energy. Bioelectromagnetics. Suppl 6. S162-S173 (2003). Brennan, C. M., Taylor, G. A. Sonographic imaging of the posterior fossa utilizing the foramen magnum. Pediatric Radiology. 40, (8), 1411-1416 (2010). Rutherford, M. A., et al. Magnetic resonance imaging of white matter diseases of prematurity. Neuroradiology. 52, (6), 505-521 (2010). Wezel-Meijler, G., Steggerda, S. J., Leijser, L. M. Cranial Ultrasonography in Neonates: Role and Limitations. Seminars in Perinatology. 34, (1), 28-38 (2010). Leijser, L. M., de Vries, L. S., Cowan, F. M. Using cerebral ultrasound effectively in the newborn infant. Early Human Development. 82, (12), 827-835 (2006). Houston, L. E., Odibo, A. O., Macones, G. A. 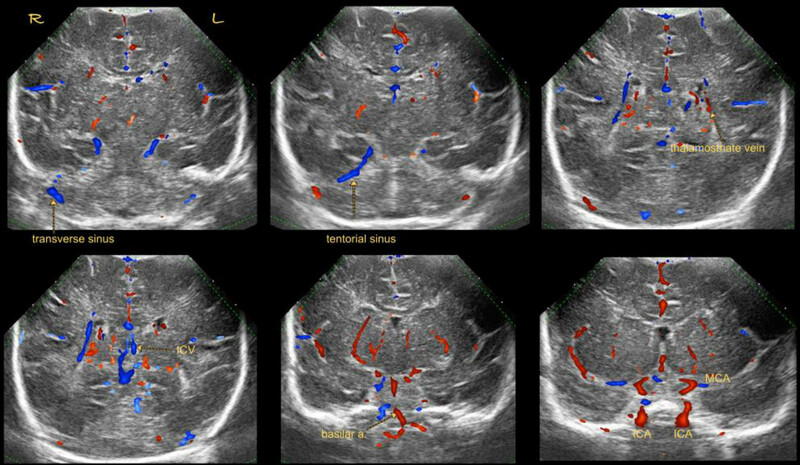 The safety of obstetrical ultrasound: a review. Prenatal Diagnosis. 29, (13), 1204-1212 (2009). Torloni, M. R., et al. Safety of ultrasonography in pregnancy: WHO systematic review of the literature and meta-analysis. Ultrasound in Obstetrics & Gynecology. 33, (5), 599-608 (2009).